I am going to end this series of blogs on resilience with something very unusual in five years of blogging – a personal testimony. Late in 1999 I returned to England in a badly damaged condition after five years of mission service in Africa. During the previous decade I had suffered overwork and stress, emotional and spiritual abuse, unresolved grief, and frequent illnesses culminating in hepatitis. And now I had chronic fatigue syndrome! Unable to care for myself, I moved in with a friend who took care of me as I slowly recovered. During this time a strange thing happened: I became filled with joy in a way that was completely new to me. I would spontaneously burst into songs of praise even when walking down the street or in the shower. My prayer life became characterised by gratitude. I was puzzled that this was at odds with my material state: poor health, no money, no hope of getting a job, the frustration of long-term illness. And then I realised the essential truth that my spirit was rejoicing in even though my mind was slow to catch up. Everything really important in life was already taken care of! God loved me unconditionally. Christ died for me. My eternal salvation was secure. So what if the rest of my mortal life was illness and poverty? This is the eternal perspective that Paul was able to tap into when enduring his “momentary, light afflictions” (2 Corinthians 4:17). 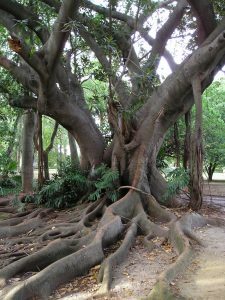 This is what happens when we have roots that run deep into God so that we can survive the tough times. It was five years before I was restored to health, and the lessons I learned during that time have been life-transforming. They enable me to thrive because my essence is focussed on my being, not my doing, and is rooted in God’s acceptance of me in Christ. They help me even at times of extreme busyness to live as a Mary, not a Martha. They also provide the experience which now equips me to help others find peace in the midst of their busy and stressful lives. I pray for each of you reading this blog, that you will also know the sense of heavenly trajectory and peace that comes from having deep roots. If you don’t, please contact us on info@syzygy.org.uk for a confidential discussion. Good blog. I did wonder.